Shocking new details about Tonto Dikeh's marital crisis has just hit the internet. The news coming from Ghana police this time, says Tonto Dikeh, during a very violent fight at her husband, Churchill’s Trasaaco estate in Ghana, destroyed $15,000 worth of property and waved a gun at one of Churchill’s bodyguards who tried to stop her from breaking the properties. This was because she claimed her husband was cheating on her. 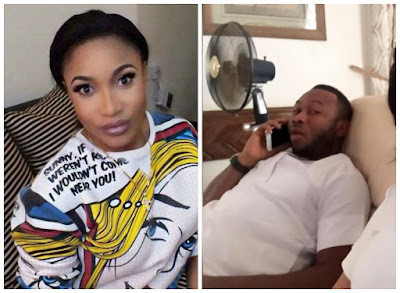 You recall, Tonto had just a few days ago, revealed in a tell-all interview that her baby's father and estranged husband Olakunle Churchill cheated and abused her while they were still together. during one of his fights with Tonto in Ghana. Oppong says they received a call to Churchill’s Trasaaco estate in Ghana where they went in to find Tonto Dikeh in a rage, destroying items in the house because she claimed her husband was cheating on her.